Build into core of Rosatom-Antonow K37-TNTRL and powered by internal nuclear turbine, EMD-14 electromagnetic mass driver can deliver 10 steel mining projectiles per second, each weighing 10kg – enough to shatter all but most stubborn asteroids. While recoil from single shots can be compensated by thrusters alone, continuous operation of EMD-14 requires using main NTR to compensate and will deplete ammunition rapidly. 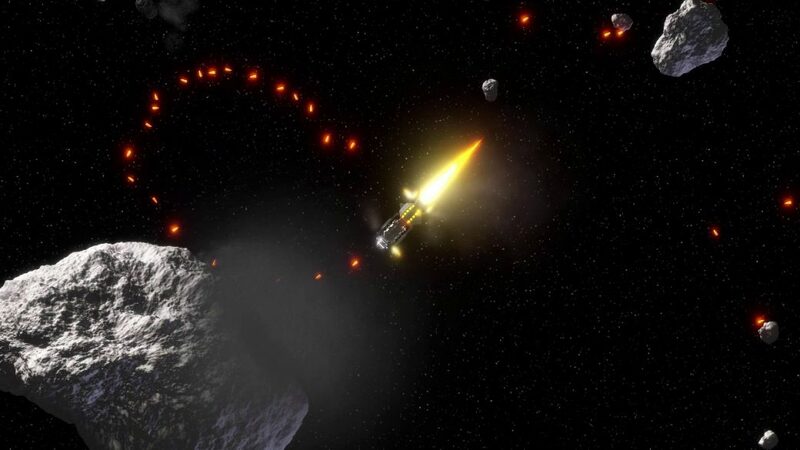 Firing process heats up projectiles to 2500K, which greatly increases asteroid melting capability. While EMD-14 can fire in wide range of muzzle velocities, pilots are advised to restrain EMD power to less than 20% in order to limit risk of debris and ricochet induced damage.